In terms of HVAC maintenance, corrosion is a major issue for building owners and managers. 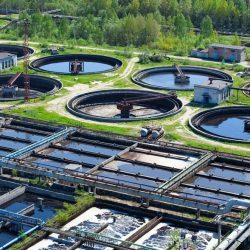 If corrosion is left untreated, the overall efficiency and longevity of the equipment can be affected, leading to an increase in operating costs and expensive replacement in the event of equipment failure. Repair and, most importantly, prevention of corrosion problems is critical to avoid premature replacement. If you have any further questions about HVAC maintenance once you reach the end of the article, you are welcome to submit them as comments and an engineer will respond shortly. What are some of the most common HVAC maintenance problems? First we will look at condenser water systems, then chilled water systems and, finally, review problem areas within air handling units and ductwork. HVAC almost always is a closed loop process, so the whole system needs to be functioning in order for any output to be achieved. To form a corrosion cell, we need 3 things. An anode, a cathode and an electrolyte. Unfortunately, all of this is usually present within an HVAC systems. Tube sheet heat exchangers are a classic example of this. Large surface areas of metal in contact with a large volume of liquid makes them susceptible to corrosion. Not only standard corrosion, but bi-metallic (or galvanic) too! If not properly treated, metals gradually self-destruct when exposed to air and water, especially where dissimilar metals are in close contact. The wet and warm conditions inside HVAC systems, combined with cleaning agents and process chemicals, accelerate corrosion. Usually in a tube sheet heat exchanger, the tubes are made from copper, whilst the face is mild steel. As copper is a more noble material, the steel will begin to corrode preferentially, causing rapid loss of material. In a lot of cases, replacement is the first choice. This brings you back to your starting point, with a brand new piece of equipment. However, this will not last. You need to ask – “have we found and fixed the root cause of the issue?”. If the answer is no, then you can expect history to repeat itself. Patch repairs and weld overlay are, to put it simply, adding more metal to the surface. With these, you encounter a few issues. You could perhaps choose to use a type of paint (limited service life) or sacrificial anodes (require replacement), but these would need routine HVAC maintenance in order to be effective. Large office buildings, hospitals, and schools typically use one or more cooling towers. 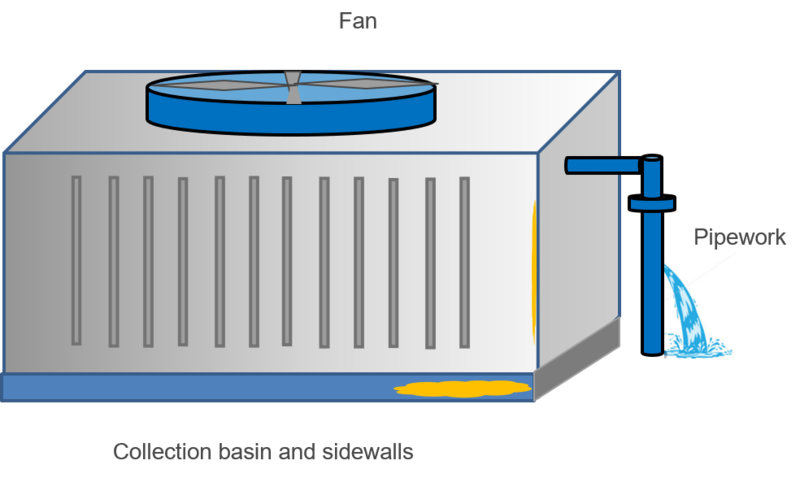 Unlike the large concrete units at power stations, these smaller cooling towers are commonly constructed from galvanized steel. The combination of air, water, chemicals and heat in cooling towers creates a severe corrosive environment. 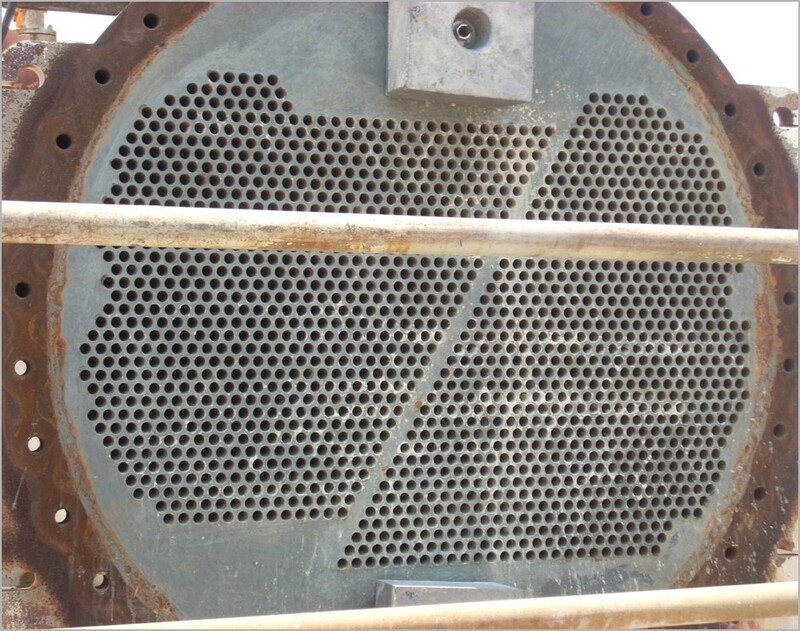 We usually see perforations and severe metal loss on units which have been in service for some time. After reviewing the problem areas, let’s have a look at some solutions in action! 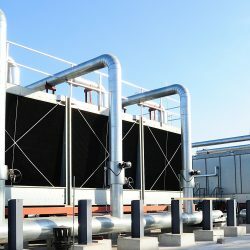 Our first case study brings us to a local bank where we are looking at three Marley cooling tower cold wells. This type of system is usually protected via galvanisation of the steel, however the chemicals which were being used to treat the water were so strong, they actually ate away the galvanised sections of steel. The exposed area, which was the pans at the base of the unit, began to corrode. The Maintenance Manager was concerned a leak would develop; so the decision was made to coat the area and seal the gaps around them. The materials used for this job have excellent adhesion and do not corrode, so problem solved! We’ve focused a lot on the towers and big units in terms of HVAC maintenance so far, but you can’t forget that something needs to transport all this water as well. As you can see from the picture below, the geometry of this leaking pipe made it quite difficult to come up with an effective repair. The engineers tasked with making a repair were struggling to find something suitable. Belzona 9611 was used initially to stem the leak, and this gave the engineers just enough time to fully wrap the small pipe section and create a permanent repair. By comparison, traditional repair methods (cut & weld) would have cost upwards of £50,000 per hour to shut down and complete the repair. Considering that this repair was inspected and found to be still going strong almost 3 years after shows how much of a saving they have made. Below, you can see a clear picture of exactly what happens when this issue goes unnoticed for a long time. Severe erosion on the FRP fan blade is evident. The worn edge of the blade has been rebuilt with a ceramic epoxy, which adheres very well to FRP. Combined with the Reinforcement Tape, it will prevent blade disintegration and strengthen its structure. This is a great alternative to replacement and jobs like this can even be carried out insitu. This system was beginning to see a loss of efficiency due to erosion of the blades. 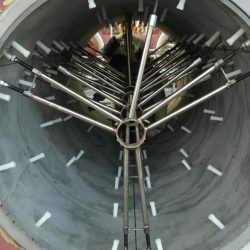 Engineers were finding that they needed to replace blades every 5-7 years, and with 12 towers this was becoming too costly. With the use of 4 different products, including Belzona 1111 (Super Metal) and ceramic coatings, the blades were rebuilt to match their original specification. The customer noted after that they had saved as much as 80% on their replacement costs – due to the minimal amount of material/equipment required. The overall cost of buying new blades was very high in comparison. 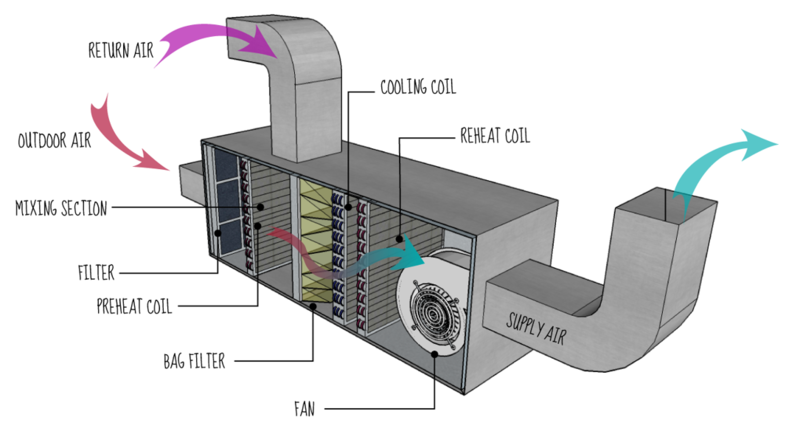 Chillers and heat exchangers are a vital part of any heating or air conditioning system. Failure can be caused by a few issues. 1) Corrosion – leads to wastage and metal loss on the tube sheet around the coolant tubes. This can be classed as either general or galvanic corrosion. 2) Leakage – loss of metal can cause leakage of the coolant and, potentially, contamination of the chilled water. 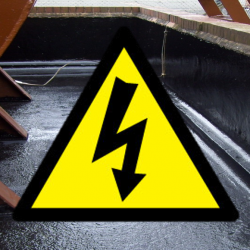 A corrosion allowance is designed to accept anticipated levels of metal loss. However, throughout its lifetime, metal losses will gradually occur. If the corrosion allowance is exceeded and gaps begin to appear, recirculation can occur, leading to efficiency loss. 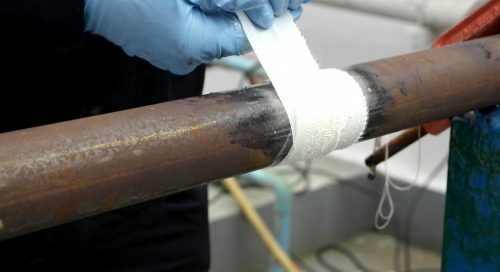 In order to prevent this from happening, a solution was devised to apply epoxy materials to a tube sheet face in order to stop the corrosion from the start. First, an epoxy paste to rebuild the lost metal, then a ceramic based coating to prevent damage from re-occurring. If you can prevent the liquid from contacting the surface, you can prevent the corrosion from even beginning. 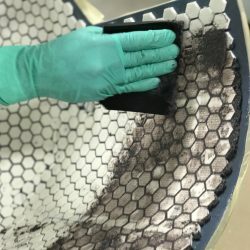 CASE STUDY: GUESS HOW LONG THIS HEX REPAIR HAS BEEN IN SERVICE? This heat exchanger, as we can all guess, has been suffering from galvanic corrosion. The customer was quoted $350,000 to replace the unit. We are not even taking the costs of downtime into account. A Belzona repair was completed for approximately $25,000. The application itself was completed in 1973; unit was set for retirement in january 2009! This application was completed in a commercial airport. In some cases, the cooling water used within a heat exchanger isn’t brought in from a pure water source. The water supplied to this heat exchanger came from a local river, which meant it came with water and lots of other undesirable things. The salt within the water meant that any corrosion could happen much faster, just as you find in a marine environment. The chiller was steam cleaned prior to repair in 2005, and found to be in great condition when it was inspected back in 2008. This chiller unit became corroded over time due to the heat generated in the system. A poor weld seam was allowing condensated water to pool between the layers of insulation. The resulting CUI damage caused the metal wall to thin down. The biggest problem faced by the engineers was that replacement would mean getting a huge crane involved, which in such a densely populated area would be almost impossible. The Belzona repair required no downtime at all, so was completed with minimal expense. It also prevented the issue from re-occuring, meaning they could use the repair on similar equipment and effectively forget about the issue. Now, the air handling system suffers many similar problems as the pipework – internal corrosion due to water condensation, high temperatures as this handles the exhaust air from the HVAC system, aggressive cleaning chemicals contained within the condesate and even microbiologcal growth. 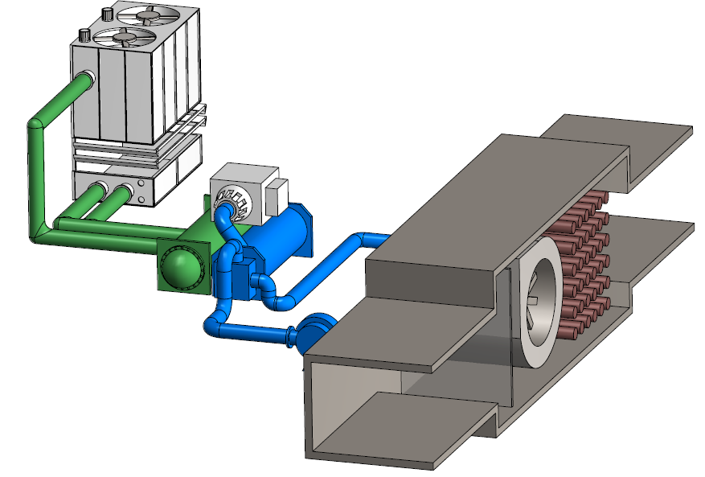 The ductwork is the lifeblood of the air based system, just like pipework in the cooling water areas. The problem comes with the design. Normally, there are many junctions, seams, seals, joints and other different geometries. This gives more areas which are susceptible to leaks. Failure of joints and seams can also allow critical ingress of water and disruption of air flow, affecting the cooling and heating process. Belzona’s flexible repair materials can restore joints and seams as a long-lasting solution. Sealing at the interface between the roof and the ductwork can also be achieved with Belzona flexible membranes. These complex contours are difficult to coat, so a system which can cope with being applied at various angles is always a positive. 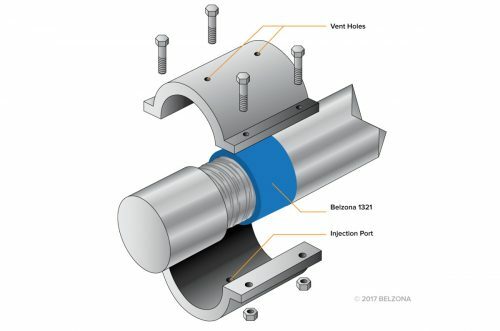 Belzona materials can be used for protecting both the internal and external of the ductwork, as well as t-pieces, elbows and other difficult areas. As we were talking about the versatility and flexibility of Belzona materials. Let’s look at these features in action. Here, the effect of weather and UV caused rubber seals around ductwork penetrations to degrade allowing rainwater to leak directly into the production area creating disruption in production and safety issues. 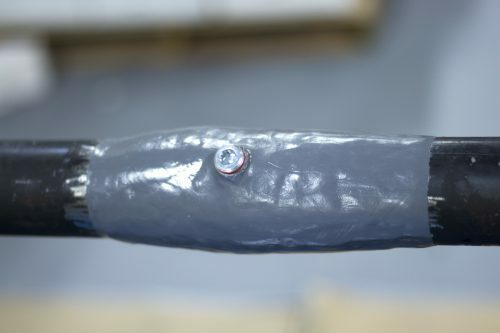 The joints were resealed with an Elastomer, before applying a fully reinforced Flexible Membrane system. This application was completed in 2 days without disrupting production, giving a long-term water and weather resistant solution. Here we are looking at cooled air roof top ducts at an Ivy League Medical School. Urethane insulation and mastic were no longer water tight. Insulation was wet and water was leaking into the building. CUI was feared. The original plan was to remove all wet existing insulation, re-insulate and waterproof over 200 feet of 60 inch carbon steel ducts. As Belzona membrane is micro-porous, there was no need to remove the insulation. It was applied on top of the existing system and is still in excellent condition 3 years on. One of the bearings on this office building’s air handler system failed and severely gouged into the fan’s shaft. The bearing seized after business hours the night before. The cooling system was nearly crippled with a triple digit in a Midwest July heat. The building was now without air conditioning for 12 hours. The shaft was supported for repair in the early hours of the morning. A suitable former was clamped in place with Belzona 1111. After a short cure, a new bearing was installed and the air handler was placed back on-line that same morning. 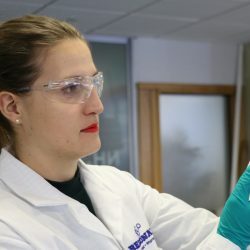 The cold curing and solvent free nature of the materials not only makes them safer to use but also aids the application as there is no shrinkage or distortion of the material during curing. All cure with a wide application window and no external heat is required. In terms of performance all the materials we’ve shown today exhibit very good adhesion to various substrates. The products are designed to provide long-term HVAC maintenance solutions, as opposed to a quick fix. This website works like Google, where you can search by keywords to find solutions to common or complex maintenance problems. Do you have a Belzona solution for a leaking central heating steel radiator( Myson) which can withstand water at 80 degrees C. and water pressure 3 metres. There are 3 in number 2mm holes at the bottom of a radiator. I have tried two applications of Milliput epoxy without success. Now for the initial thoughts on this application. Prior to the application, ensuring optimum adhesion is a crucial step. Roughen, clean and degrease the surface. This will promote both mechanical and chemical adhesion. Next, assuming it is not feasible to drain the radiator, the leak would need to be stopped potentially using Belzona 9611 (ES-Metal), a two-part mouldable putty. On its own, it would not be as effective at temperatures of 80C. Therefore, once the area around the defect is dry, Belzona 1111 (Super Metal) could then be applied to consolidate the repair. Excelente material para conhecimento e divulgação.